Australia's most outstanding male. Australia's National Champion in 2004 (at five years of age), and sire of 2005 National Champion (Banksia Park Khan ET) and 2003 National Champion (Blue Grass Centurion). 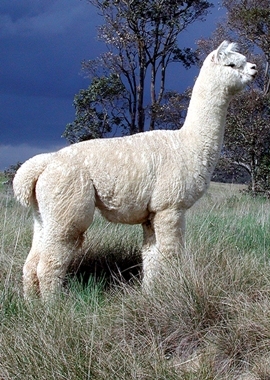 Winner of Austraia's ‘Grand Slam' for 2004, winning the country's three largest and most prestigious alpaca shows (National Classic, Royal Melbourne Show, Royal Sydney Show). The perfect combination of fineness, incredible density, crimp, lustre, coverage and conformation. Solid white male. 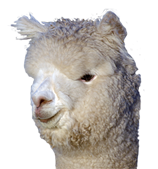 Sired by Jolimont Conquistador. Jolimont Warrior - Australia's most sought after bloodline.